"New York's traffic station. This is WCBS Newsradio 880." WCBS (880 AM), known as "WCBS Newsradio 880" (pronounced as "Eight Eighty"), is an all-news radio station serving New York City, New Jersey and Connecticut. Owned by CBS, WCBS is a 50,000-watt clear channel Class A station and is the flagship of the CBS Radio Network. The station's studios are located in the combined CBS Radio facility in the Hudson Square area of Manhattan, and the transmitter is located on High Island in the Bronx, New York. WCBS broadcasts in the HD format. It is also heard on the HD 2 channel of 101.1 WCBS-FM. Soon after this purchase the station moved to a new frequency, this time to 860 AM, and would eventually increase its transmitting power from 5,000 to its present 50,000 watts. The station also moved its studios into the CBS headquarters at 485 Madison Avenue (on the corner of 52nd Street). The station, still operating as WABC, featured a mix of local interest programming, ethnic content and music programs from CBS's national feed. As time went by, WABC turned more and more to the national programming provided by CBS and its affiliates, and its broadcast day was influenced by CBS's growing interest in news programming. In 1939, the broadcasting operations were moved across 52nd Street from the headquarters to the new CBS Studio Building. In 1941, WABC moved to the frequency it currently occupies, 880 AM, and changed its call letters to WCBS on November 2, 1946, to identify more closely with its parent network, the Columbia Broadcasting System or CBS, and avoid possible confusion with the rival network of the American Broadcasting Company (ABC), which had begun operation in 1943. As a result, this station has no relation to the longtime ABC radio flagship station on 770 AM that began in 1921 as WJZ, and has operated as WABC since 1953. Over the next 20 years WCBS developed a series of radio soap operas, afternoon talk shows and an all night easy listening music show, "Music 'til Dawn" hosted by Bob Hall and sponsored by American Airlines. During this time WCBS featured well-known personalities including Arthur Godfrey, future CBS News President Bill Leonard, author Emily Kimbrough and folk singer Oscar Brand. One cause célèbre involving WCBS emerged in the 1950s. One of its daytime hosts, John Henry Faulk, was part of an anti-blacklisting wing (including legendary CBS newsman Charles Collingwood) that took over leadership of the flagship New York chapter of the broadcasters' union AFTRA. After Faulk and WCBS came under pressure from anti-Communist group Aware, Inc., Faulk and attorney Louis Nizer sued Aware, Inc. for libel, a case often considered one of the key turning points in the battle against McCarthyism. Faulk was supported by fellow CBS broadcaster Edward R. Murrow, who was tipped off to Faulk's plight by Carl Sandburg. According to Murrow biographer Joe Persico, Murrow gave Faulk the money he needed to retain Nizer as his lawyer. Faulk finally won the case in 1963, in the meantime becoming a popular radio personality in his native Texas, and later, a national television personality as a regular in the cast of the country music/humor variety show Hee Haw. WCBS fired Faulk because of declining ratings while he waited for the case to come to trial, but Stanley Cloud and Lynne Olson's book The Murrow Boys asserted that WCBS executive Arthur Hull Hayes admitted on the stand the station's overall ratings, not Faulk's specifically, had slipped. The controversy became the subject of the 1975 CBS television movie Fear on Trial, based in part on Faulk's autobiography of the same name. Since 1924, WCBS has been known for announcing the time consistently every three minutes. This is because during the early 20th century, not all listeners had reliable time pieces. They relied on syncing their clocks up with the radio almost every day. To this day, WCBS announces the time frequently. On the hour, WCBS plays the iconic and distinctive CBS network "ding" indicating that the time is on the hour (although the station now broadcasts with a 10-second delay). The time is distinctly introduced with "WCBS news time: _:__". This standard practice, with slight variations, is also used at other CBS-owned-and-operated news radio stations nationwide. By the late 1950s and early 1960s, WCBS evolved into a Middle of the Road (MOR) music and personality format, which included limited talk programming. Personalities included legendary morning host Jack Sterling, Bill Randle and Lee Jordan. Like many MOR stations at the time, WCBS did mix in softer songs by rock-and-roll artists. Its ratings at the time were ordinary compared to the higher ratings at WOR and WNEW, both of which also had MOR formats and more distinct identities. Through it all, the variety show "Arthur Godfrey Time" remained a weekday mid-morning staple. 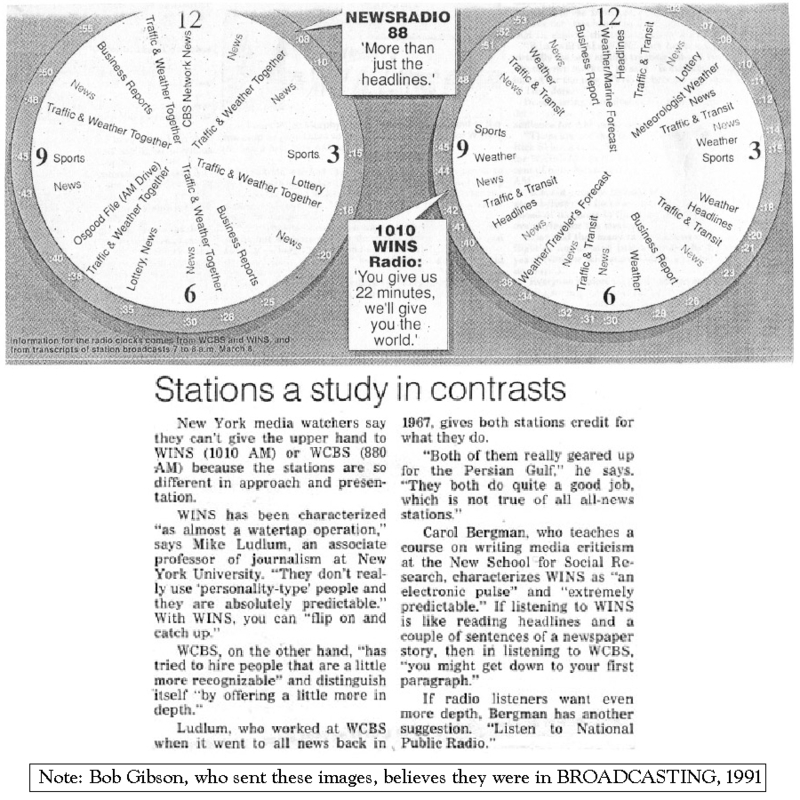 Eventually, WCBS gained a foothold in local news coverage (WOR and WNEW's strengths) bolstered by its standing as CBS's flagship radio station. During the 1960s, CBS chairman William S. Paley was concerned about the station's low ratings, and that concern started a process that would lead to the creation of a news radio format that would become known as "Newsradio 88". This format debuted on August 28, 1967 – although on WCBS-FM, because a small airplane had crashed into and destroyed the WCBS/880 antenna tower just a few hours earlier. Its original roster of anchors included Charles Osgood, Ed Bradley, Robert Vaughn (not related to the actor of the same name) and Pat Summerall. Later anchors included veteran newscaster Lou Adler, and others like Jim Donnelly, Harvey Hauptman, Bill Lynch and Gary Maurer. Initially, the station ran news in the drive time periods but maintained an MOR format during the midday and overnight hours, and within a couple of years, it ran all-news programming for much of the broadcast day except for overnights. "Newsradio 88" began its transformation into an all-news format in 1970, when the overnight American Airlines-sponsored Music Till Dawn ended in January of that year, and completed the process in 1972, when Godfrey's weekday morning variety show came to an end. The station built a reputation as an all-news powerhouse during the 1970s, and has continued with an all-news format to this day. Although WINS has usually received the higher Arbitron ratings of the two all-news stations, WCBS has had the stronger ratings in the suburbs because of its broadcast-signal pattern. Its traffic reports and news coverage includes more of Long Island and the northern and western suburbs of New York City than WINS, and it occasionally allows room for longer interviews and analysis pieces than does WINS. The station is less tightly formatted than WINS, and formats at a half-hour cycle instead of a 20-minute cycle. Also unlike WINS, WCBS does not change anchors every thirty minutes during its daily schedule. Instead, each solo anchor or anchor team on weekdays has a set shift from 5 AM until 8 PM, with two anchors switching every one or two hours after that. On weekends, anchors also alternate every hour. In October 2000, WCBS made another physical move, this time from CBS corporate headquarters at 51 West 52nd Street (the building known as "Black Rock") to the CBS Broadcast Center at 524 West 57th Street. Around this time, the station began referring to itself on air as "Newsradio 880". On December 2, 2011, the station moved its operations again to 345 Hudson Street, known as the Hudson Square Broadcast Center, sharing space with CBS Radio's other New York stations. For years, WCBS has sold the fact that it pairs its traffic and weather reports every ten minutes and came up with the tagline "Traffic and Weather Together" to promote this. The station's chief meteorologist, Craig Allen, and its rush hour traffic reporter Tom Kaminski, have both been with WCBS for over three decades and recorded a series of commercials together to that effect. WCBS' promotional work was the inspiration for the title of the Fountains of Wayne album Traffic and Weather, according to an interview the New Jersey based band gave to the station. WCBS' switch to all-news was directly spurred by the switch of WINS to a similar format in April 1965. It was also the first move in CBS Radio's long-term plans to convert its group of AM stations – along with WCBS, the group was then composed of KNX in Los Angeles, WBBM in Chicago, WCAU in Philadelphia, KMOX in St. Louis, WEEI in Boston, and KCBS in San Francisco – to some form of news programming. Once WCBS had been established in the format, CBS began to work on the rest of its AM outlets. KCBS, KNX and WBBM all transitioned in 1968. WEEI adopted an all-news format in 1974, and WCAU made the switch a year later. The programming shift was a gradual one just as it had been at WCBS, with the stations running all-news most of the day while some local and network non-news programming remained at first. KMOX, which had been programming a talk radio format for several years was left unaffected, though it would later evolve into a news/talk station. In Boston, Chicago, and San Francisco, CBS-owned stations had a monopoly on the all-news format. But in New York, Los Angeles and Philadelphia, CBS had to compete with Westinghouse-owned stations (WINS, KFWB and KYW, respectively) which had adopted all-news programming before the CBS stations did. While the Los Angeles stations made the switch within days of each other, WCAU in Philadelphia did not switch to the format until 1975, giving KYW a ten-year head start with the audience. Many blame this as the primary reason WCAU did not succeed in competing with KYW; the all-news format on WCAU lasted only three years. In contrast, the other CBS all-news stations experienced success and stability with the format. In 1995, Westinghouse merged with CBS, making WCBS a sister station to its longtime arch rival WINS. As of 2016, CBS Radio operates eight of the country's largest all-news radio stations: WCBS, WINS, KNX, WBBM, KYW, WBZ in Boston, WWJ in Detroit and KRLD in Dallas. WCBS has served three stints as the radio flagship of the New York Yankees baseball team, with the most recent running from 2002 until 2013. The station had previously carried the Yankees from 1939 to 1940 (when the outlet was known as WABC); and from 1960 to 1966, a period that included a time in which the team was owned by CBS Inc., which purchased a majority interest in the Yankees in 1964. The broadcaster sold the club to a group led by George Steinbrenner in 1973. Although WCBS is no longer home to the Yankees, as sister station WFAN-AM-FM has been in possession of those rights since 2014, it has since become WFAN's primary overflow station. Early season New York Giants football games are mostly carried by WCBS due to conflicts with the Yankees. The station also carries New Jersey Devils and Brooklyn Nets games that conflict with Giants games or when both teams are scheduled to play on the same night, including when either team plays while a Sunday night, Monday, or Thursday football game is also being played; the game will start on WCBS, with WFAN joining the broadcast when the primary event concludes. The station continues to offer continuous news coverage on its web feed during these events. Beginning in 2016, the New York Islanders moved their flagship station to WCBS for that year's playoffs, with WFAN airing select games when available; the Islanders had up to this point resorted to airing on noncommercial WNYE, which had limited the team's ability to earn money from the broadcasts. Until WFAN began broadcasting its all-sports format in 1987, WCBS was the primary outlet for CBS Radio Network coverage of professional sports events, including Major League Baseball and the National Football League. It also served as the flagship commercial station for St. John's University basketball games during the Johnnies' renaissance in the 1980s and 1990s. WCBS also served two tenures as the flagship station of the New York Jets. In its pre-all-news days, WCBS also carried the Major League Baseball New York Giants (as part of the 1930s-40s Giants-Yankees home game package), the New York Giants of the American Football League (since merged into the National Football League) and the NBA's New York Knicks. WCBS served as a springboard to athletes-turned-broadcasters in its pre-all-news period. Most notably, former football Giants Pat Summerall and Frank Gifford were employed in various capacities by WCBS and the CBS Radio Network late in their playing days. One of New York sports broadcasting's legendary figures, Marty Glickman, served as sports director during a time in the 1960s. Mel Allen gained renown as an all-purpose broadcaster on WCBS and the CBS Radio Network before and during his tenure as the Yankees' lead broadcaster. Decades later, Ed Ingles (now at Hofstra University-based WRHU-FM) established a 25-year career as sports director and morning sports anchor at WCBS, reporter for the Jets and St. John's broadcasts, and mentor to several veteran local and national broadcasters such as Barry Landers, Bill Schweizer, Spencer Ross and Bill Daughtry. In late 2004, WCBS began to stream its programming over the internet. When WCBS served as the flagship station for the New York Yankees, the station was not allowed by Major League Baseball to transmit the game broadcast over the station's web feed.